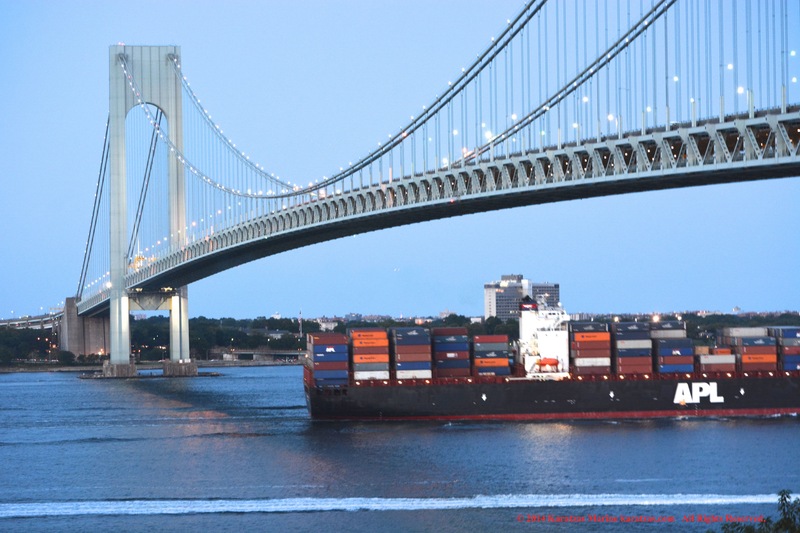 Posted on September 1, 2014 by Karatzas Marine Advisors & Co. IDENTIFICATION: Ex-name is NOL Cyprine. Launch Name was NOL Cyprine. 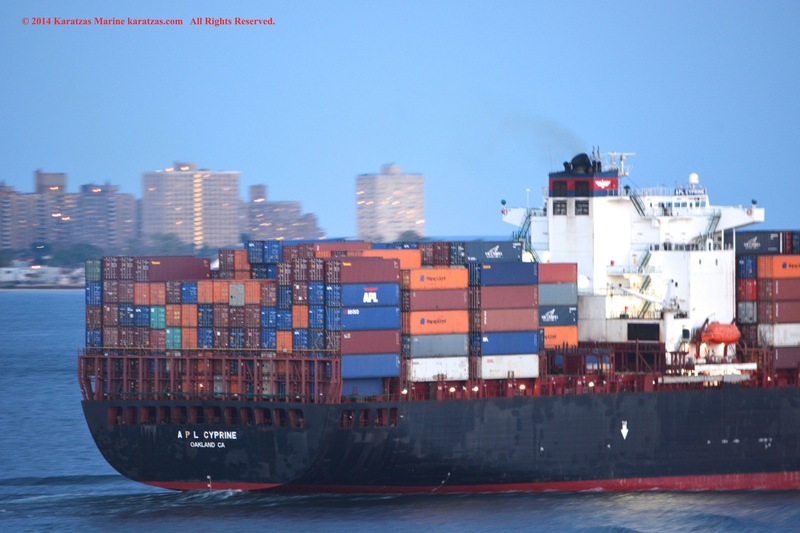 Post-Panamax Containership, Call Sign S6JQ, IMO Number 9139725. 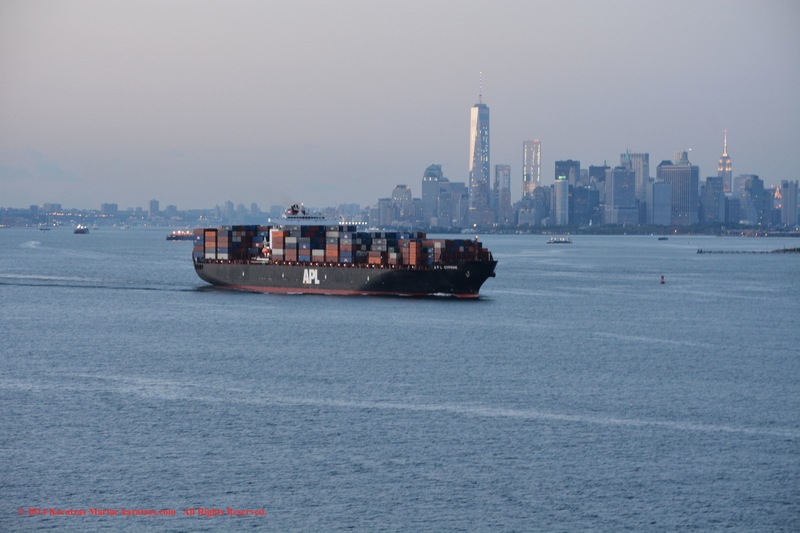 Built at Samsung H.I., United States-Flagged, ABS Classed, Length Overall of 272.05 m., Length Between Perpendiculars of 258.00 m., Draught of 13.50 m., Beam of 40.00 m., 89.20 Tonnes per Centimetre Immersion, Gross Tonnage of 65,475, Moulded Depth of 24.40 m., Tonnage of 28,825 International Net and 63,132 Dwt (long). Sulzer Engine, Speed of 24.50 kts at 135.00 tonnes per day, Horsepower of 66,120B at 102. Engine Description 2 S.A. 12-cyl., Engine Model 12RTA84C. OWNER / MANAGER DETAILS: APL Co. Pte. Ltd., website details: http://www.apl.com. 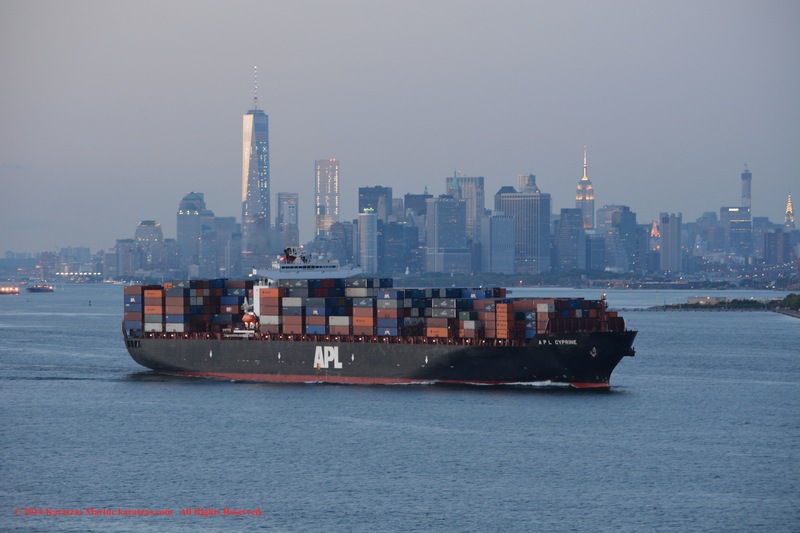 SPECIALIZED DETAILS: Teu Capacities of 5,020 Total, 4,386 Homogeneous and 700 Reefer, 16 Hatches, Ship is too large to transit the Panama Canal, Dwt to Teu ratio of 12.78, Maximum Teu of 2,544 in the Holds and 2,476 on Deck. 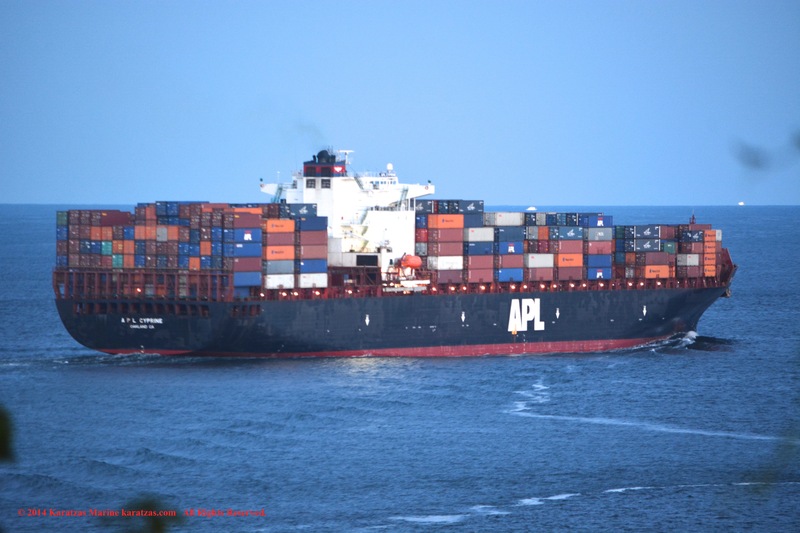 Total Teu Capacity of 5,020, 16 Hatches. 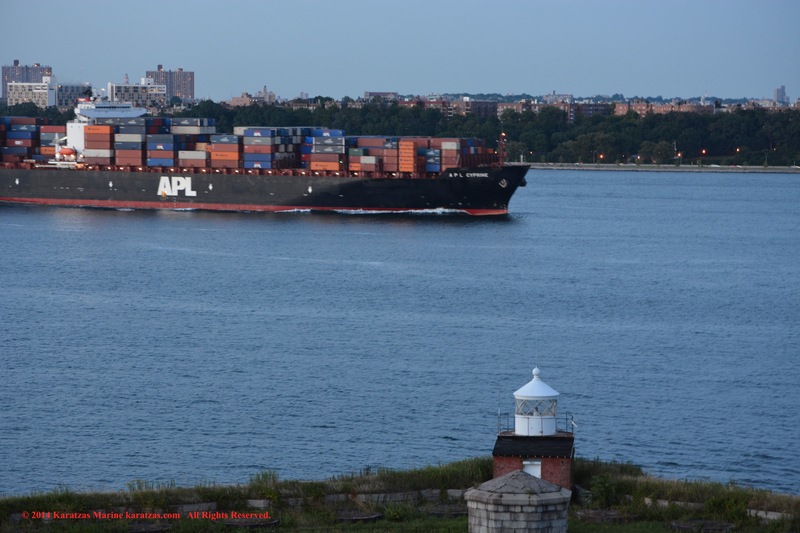 This entry was posted in American Flag, Containership, Port of New York and tagged APL Co. Pte. 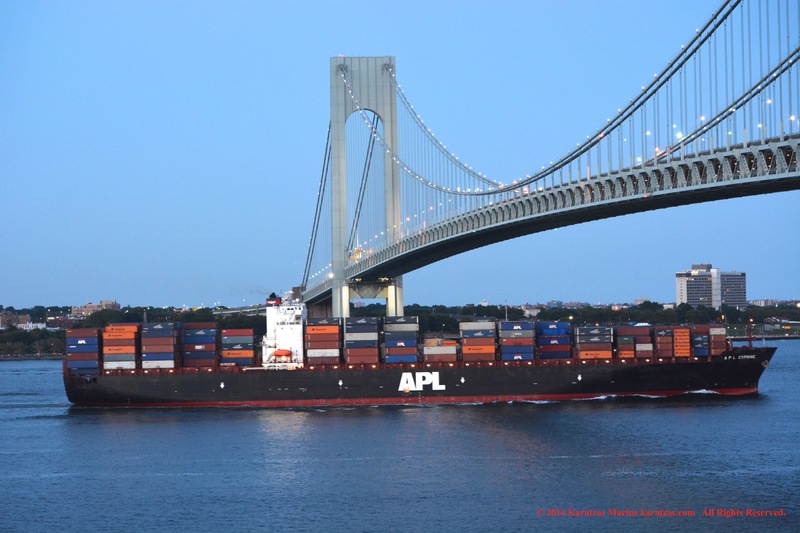 Ltd., Basil Karatzas, Karatzas Marine, Karatzas Marine Advisors & Co., Manhattan skyline, New York Harbor, post-panamax containership, Verrazano, Verrazano-Narrows Bridge by Karatzas Marine Advisors & Co.. Bookmark the permalink. This ship is not Singapore flagged. It’s American. Thank you very much for the follow up and correction. 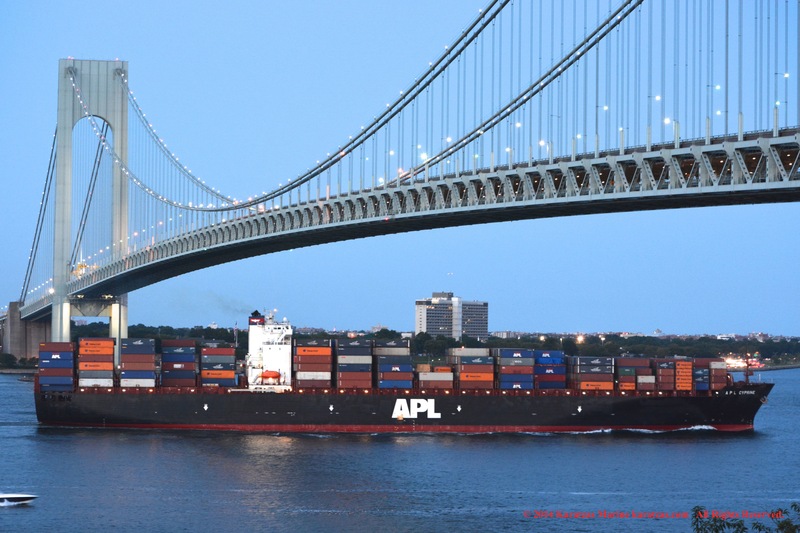 Indeed, MV ‘APL Cyprine’ and also MV ‘APL Pearl’ changed registry to U.S. Flag since 2009 with homeport Oakland, CA; previous flag state was Singapore. Regrettably, still many databases report both vessels under Singapore flag which is not correct; we regret the error in copying them. 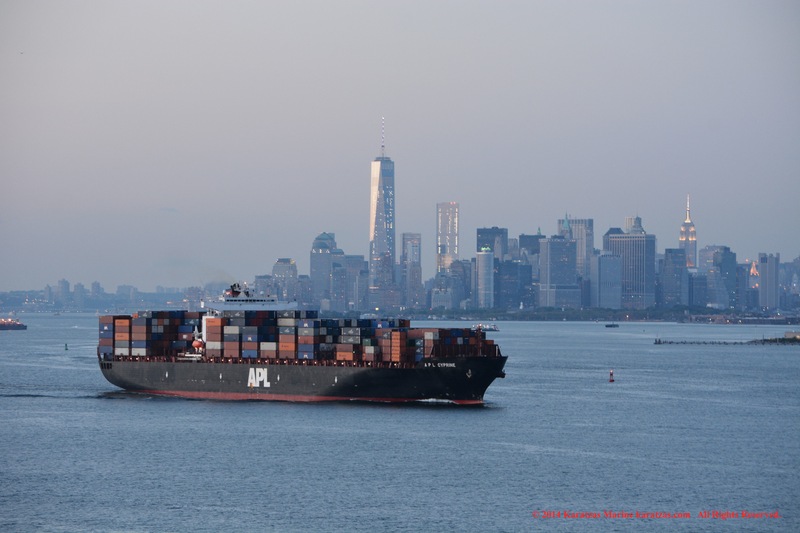 After all, APL (American President Lines) was established as an American flag company in 1848 with Pacific Mail Steamship Company as its corporate predecessor. Additionally, APL BELGIUM, APL CORAL, and APL AGATE are all American flag. Cyprine and Pearl flagged in together under AMO, while AGATE flagged in with APL JAPAN (now returned to Singapore flag) under MMP (also in 2009). 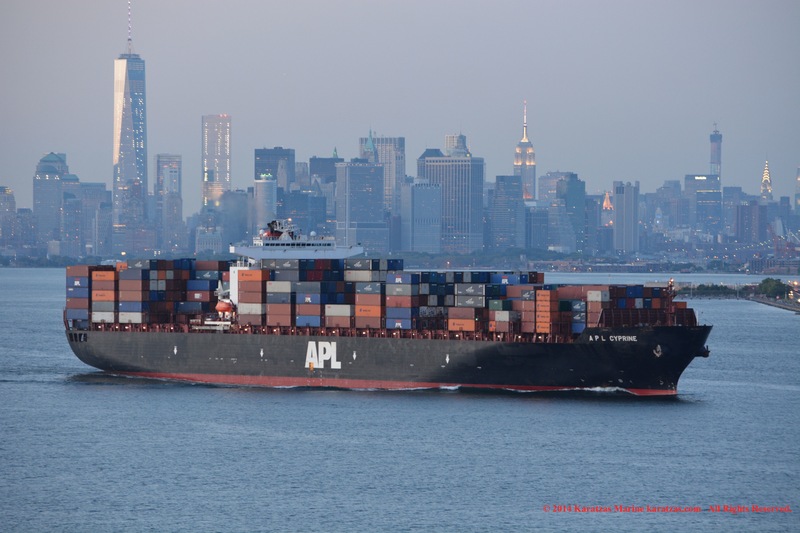 Both CYPRINE and PEARL are under MMP contract now (as are ALL of APL’s American ships). I am currently sailing as 2/O aboard CYPRINE, and was on the bridge when this pic was taken. 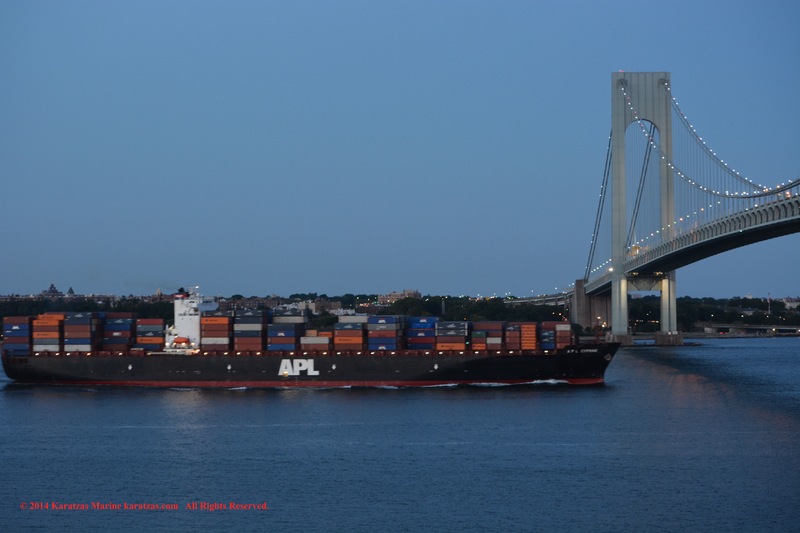 I was 3/O on APL JAPAN when she flagged in, and 2/O when she flagged back out. I was also 2/O on the BELGIUM last year–early in her American flagged career. Thank you for your email and for letting me know, and your sharing such information with us. Amazing that you were on the bridge when these pictures were taken! 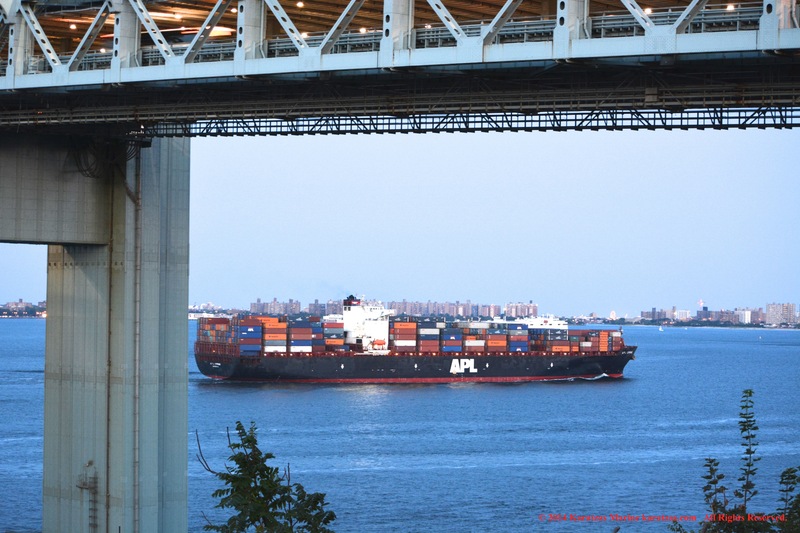 Please let me know next time your good ship will be calling New York Harbor again, and depending on my business traveling, I will do my best to be back for more pictures! Calm seas and fair winds, and profitable and exciting voyages ahead of you! Enjoy the open ocean for us landlubbers! Hope you get to be with your family soon and safely!